Comrex Road Warriors - Live & Local: Somewhere...Beyond the Sea! San Diego, CA -- As the immortal Bobby Darrin crooned away in the background, listener's of The Keith DeGreen Show on Clear Channel's KFYI/Phoenix were witness to a little bit of history with the commencement of DeGreen's departure for a voyage around the world. DeGreen, who broadcasts his show each Sunday from 8 a.m. to 11 a.m., shoved off while live on the air via his Comrex ACCESS codec. His global voyage began on April 1st aboard his new 55' Nordhavn Motoryacht outfitted with all of the latest bells & whistles including an ACCESS Rackmount Stereo BRIC IP Codec. Getting IP connectivity on the open seas is no small feat. So, for this, DeGreen and his crew turned to KVH and their Inmarsat Fleet 77 domed transmitter/receiver with gyroscopic tracking which provides this IP-over-satellite connection. 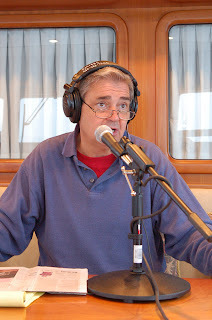 "On Sunday February 15, 2007 we were the first -- using our Comrex Access rack-mount unit and a broadcast studio we built in the pilot house of our ship -- to broadcast a regularly-scheduled radio show from a private ship at sea. The program, Keith DeGreen's Global Adventure Finance Show, was heard on NewsTalk 550, KFYI, Arizona's largest talk radio station during its regular time from 8--11 AM AZ time. At the time, our ship, The Global Adventure, was about 12 miles southwest of San Diego, in Mexican waters. After each broadcast, the radio show is promptly posted to our website at www.theglobaladventure.com. We also post new photos, videos of our journey, plus commentary, on the website daily. Our stated mission is to explore the politics, culture, economy and investment opportunities at ports of call around the world -- and to provide no-nonsense investment advice on our show and website. 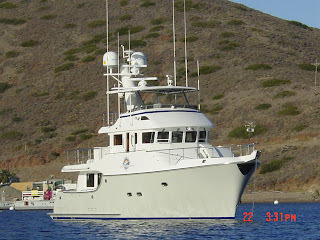 On Sunday, March 18, 2007, we again broadcast the entire show while at sea -- this time from about 20 miles due west of San Diego. The Comrex access unit performed flawlessly both times. However, an automatic shut-down program within our KVH 77 SAT-COM antenna took us off the air briefly on a couple of occassions. When that occured a pre-recorded evergreen show at the station kicked in. We are working with KVH to override that shutdown function in order to facilitate uninterrupted use of the KVH unit for up to three hours at a time, and we're confident that this will not occur again. On April 1, 2007, we will shove off from San Diego on the first leg of our open-ended journey. We will broadcast from approximately 1200 miles out to sea on Sunday April 8 -- a little more than half way to Hawaii. We will make landfall at Honolulu on the 11th or 12th of April, and on Sunday, April 15 we will broadcast live from the Hawaii Yacht Club in Honolulu. We plan many other exciting broadcasts from at sea, and from interesting ports of call. Our itinerary just between now and the end of the year includes stops at The Marshall Islands, Micronesia, The Philippines, Taiwan, several ports in China including Hong Kong, Vietnam, Cambodia, Thailand, Brunei, and Singapore. After the first of the year we plan to visit India, Sri Lanka, The Maldives, Dubai, Yemen, and to enter the Mediterranean via the Suez Canal by April 1, 2008. We will interview business leaders and officials at each port of call, and will be constantly taking photos and videos, writing commentary, and having fun -- and it will all be online at www.theglobaladventure.com." Well, Keith....Bon Voyage! It sounds like an exciting adventure! We're thrilled to be a part of it!